There are no mothers in Lear – motherhood is natural love, innate love, nourishing love – surely not the only love, but the most reliable love. The widowed father disinherits the daughter who truly loves him, then is betrayed by the daughters to whom he gives his kingdom. These daughters not only cuckold their husbands, but draw the nation into Civil war. A son betrays his brother and father, leading to a violent maiming of the father. Everyone dies unredeemed, yet proclaiming the need of redemption and acknowleding that the only way to redemption is the love that eludes nearly everyone caught up in this nightmare, Shakespeare’s most sustained phantasmagoria. 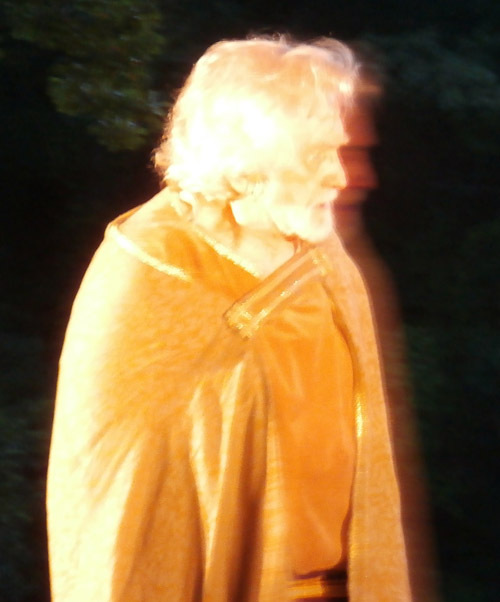 Lear makes us wonder if love truly exists, then proves its existence by its obvious absence. Lear is a gnarly immersion into nihilism from which we eventually emerge more able to resist nihilism’s inescapable lure. As Harold Bloom (my guru in Bardalotry) says, the play is the most emotionally disturbing (Hamlet is the most intellectually disturbing) in Shakespeare’s oeuvre. The Inwood Lear is a wonderful version of this play, briskly paced, entertaining and subtle. Lear lingered in my mind for days after seeing it. 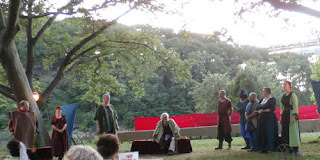 King Lear is being produced by the Moose Hill Theatre Company as part of the 2013 InwoodShakespeare Festival. Inwood is way up in Manhattan – it is north of the Cloisters! – and also the birthplace and home of the poet, rock singer and writer, the late, great Jim Carroll. 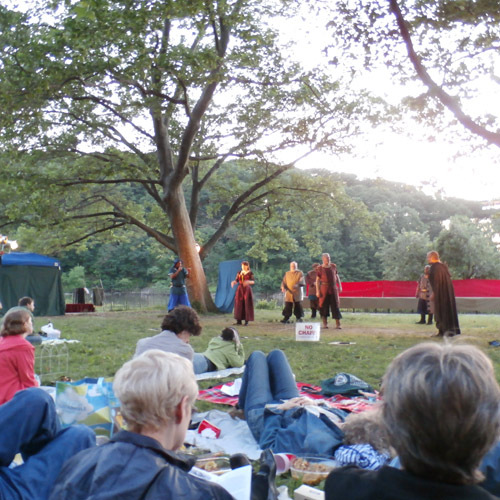 A bucolic part of New York City, as hilly and charming as San Francisco, Inwood Park, infused with late spring natural splendor, was a perfect setting for some Shakespeare. Lear is my favorite Shakespeare, although I sometimes think my favorite Shakespeare is the one I am reading or seeing now. Nonetheless, Lear holds a special place in my heart. I have a vivid recollection of seeing on Channel 13 (PBS) the James Earl Jones Shakespeare in the Park (Central) and being awestruck. I think it was well before high school, and although a reader, I hadn’t experienced much literature, unless you count H.G. Wells. In College, I had a great Shakespeare professor, and while I can’t exactly recall his Lear lecture besides that it was great, I do remember how he used some stage craft to underscore his point. He didn’t turn on the lights for the lecture. The class was in the afternoon, and it was fall and getting dark earlier and earlier. In my mind’s eye, I can still see the bearded scholar, slumping in the chair, ending the lecture, the plump Riverside Shakespeare in his lap, dense shadows painting the classroom black. Armstrong makes the pedulum swing shift in the outward and innner Lear less jarring by leavening the entitled arrogance of the king with unhinged anxiety. His gesticulations – particularly when he learns how his two favored daughters are conspiring against him – reminded me of nebbish-era Woody Allen, curling his fingers, touching his face – signifying he cannot believe what he is hearing. His is a neurotic Lear, which makes the last two acts less stagey, the tragedy and overwhelming sorrow as the drama concludes, more credible. 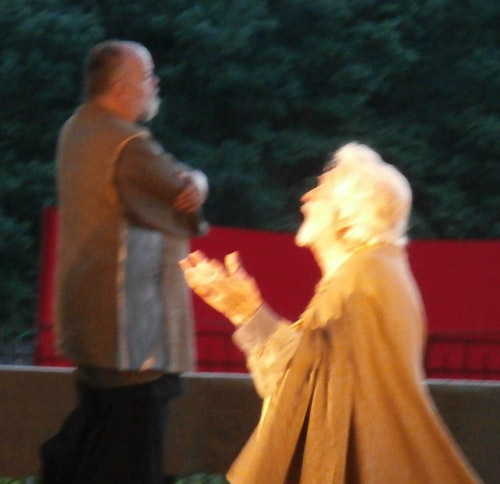 Much about Lear is about his descent into despair and madness and actors revel in this opportunity for bluster. But with tones of exasperation, and similar hand gestures, the Inwood Lear’s deterioration is more gradual, thus more understandable and convincing. 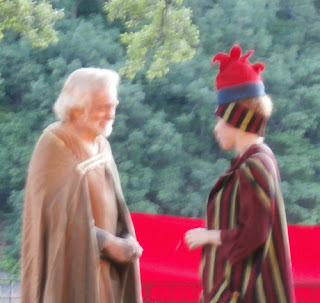 Those sorrows are not redeemed, but the fact Lear understands the need for redemption – and that he understands the redemption is the true love his daughter – Jodie Pfau, an elegant and earnest Cordelia – is sufficient satisfaction for the audience. This Lear was less fractured. The despair of this father, who not only caused the death of the only daughter who truly loved him, but dies unredeemed, seemed a more consistent manifestation of the neurosis driving his odd behavior (splitting up his kingdom before he dies, then immediately regretting that move, etc) and the unfathomable motivations for that behavior. I liked the consistency of the portrayal; it added nuance and subtlety where other actors usually rely on bombastic ranting. 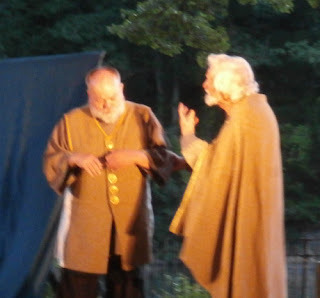 I flashed that maybe the play is actually stream of consciousness – everything is happening inside Lear’s head – and the voice of conscience in the king is The Fool –and the the same anxiety Lear expresses upon learning of the actual betrayal in the earlier scenes by his daughters are echoed in the ravings on the heath; both experiences of Lear are suddenly equivalent in terms of psychological trauma. 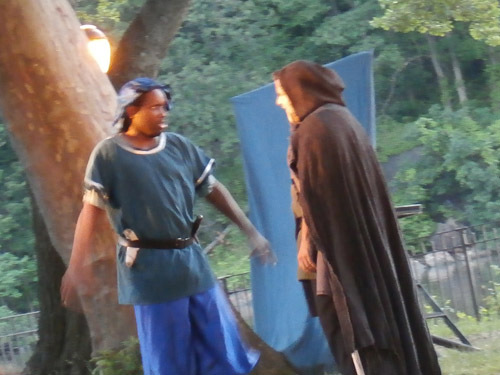 The two half brothers, Edmund (Warren Jackson) and Edgar (Robert J. Dyckman) also added to the comic overtones, with Edmund having a supercilious delivery to his lines even as he plays the roguish lady’s man, who is sleeping with both Reagan and Goneril – again adding to the farcical nature of Shakespeare, before the devastating tragedy takes hold. The mouth kisses the women give Edmund are both passionate and comic. When Edmund dies, with the “some good I mean to do despite of mine own nature,” the shedding of what seemed to be a comically evil and horny portrayal underscored what is a powerful moment of self-revelation, played superbly. Edgar almost tests the limits of the comic direction as Tom Bedlam, yet we see the compassion for his blinded father, a compassion of strange pathos, and suddenly its Edgar’s play at the end – well, he is one of the few still living – but he has been transformed, “We that are young shall never see so much nor live so long.” And while all grown up, sane and sober, there was a fear in this warning. We may not have fully forgotten the comic bits in the action that the Moose Hall players interlaced with the action to get us here, but wonder if we were laughing in the graveyard. Were we using a sort of gallows humor to deflect the suggested notion that our lives will now somehow not be as fully experienced, in spite of what should be the solace of knowing the horror has concluded. Lear is based on a real English king, who reigned nine centuries before the birth of Jesus Christ – ancient Britan. Edgar, who succeeded Lear as king, legend has it, chased the wolves out of England. The more you dig into Shakespeare, the more truly weird he becomes. Dykman got all the ambiguities of this last line right, underscoring the culmination of poltical intrigue, familial betrayal and unrelenting disappointments. Of course, what is Lear without the Fool, and this casting choice was clever, a marvelous turn by Samantha Bruce. Sheer brilliance having the Fool be a woman, dampening the oft-wild misogyny Lear is laden with, also adds to the humorous introduction of the Fool by subverting the coxcomb pun (male organ). Dislocations readers may remember Michael Hagins from lastyear’s Othello and The Comedy of Errors, which he also directed. Here he was Oswald, Goneriel’s “Steward,” which he plays as a fop, amping the antic comedy with some delightful physical humor, tripping and rolling around in the grass, reminding me of some of the pratfalls and other memorable contortions Hagins displayed last year on the Jersey side. Oswald a small but pivotal role, gets beat up a lot and ordered around by Goneriel, a haughty interpretation by Kelly Jean Clair. The few flaws of the evening had nothing to do with the play, just the planning and overall operation. There was a lack of adequate bathroom facilities – the park was large, but there were only some port-o-potties that looked (and smelled) like they hadn’t been cleaned or emptied since the Koch Administration. Speaking of NYC flaws under the Bloomberg regime, the reason for the few pictures here in this post is that a Moose Hill flunky stopped me from taking pictures, you know, in a public place. Seriously, some rather dicky production guy asked me to stop “recording”. Nothing was said to the four young women on the blanket next to me aiming their smart phones at the actors all night. I guess because I held an actual camera, the Moose Hill Theatre Company official was technically in the right. It’s not so much that the Fascism Bloomberg has imposed city-wide across the Hudson is new, but what still shocks me is how many of the younger New Yorkers eagerly enlist in the civilian gestapo corps. Aside from that disturbing removal of the freedom of the press and other constitutional rights, my only complaint is that the sound system kept malfunctioning. These stageless park presentations are always challenging to stage. In Jersey City park productions there is no amplification, which is a definite drawback, reducing subtlety as actors strain to be heard above the din of traffic. In Inwood, except for the whistles and steel wheels-on-steel-track rattle of the Metro North and Amtrak across the estuary – or the sound of picnicers in a nearby but different section of the park – there was relative quiet. Some of the actors were miked, but the sound system kept malfunctioning. 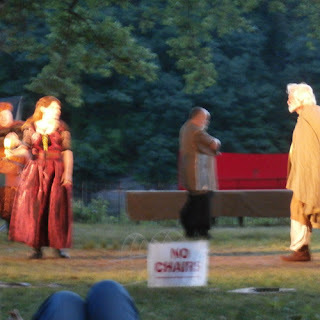 During the scenes on the heath, a thunderstorm was heard on the sound system, which was cool, but the microphones on the actors were inconsistent. Voices kept dropping in and out of amplification, feedback burst throughout the performance, obscuring the dialog. Perhaps if the theater company stage hands were less concerned about a poor blogger trying to snap a decent, in-focus picture and more attentive to the audio system, instead of ranging from adequate to distraction, the sound system could have ranged from adequate to enhancement.